And find out how to make it stop! If some skincare products can give you a flaky complexion, the same can happen between hair products and your scalp. Instead of cleansing your hair, they leave an oily residue and become a hotbed for dirt and dead skin cells to grow. Solution: Be mindful of the ingredients! Always check what you're putting in your hair. Take note of ingredients like sulfates, silicones, formaldehyde, etc. as they can cause allergic reactions on your scalp and lead to dandruff. Solution: Wash your hair every other day. This way, you'll be able to properly cleanse your scalp and hair of all the dry shampoos, wave sprays, and salt sprays you've been applying. 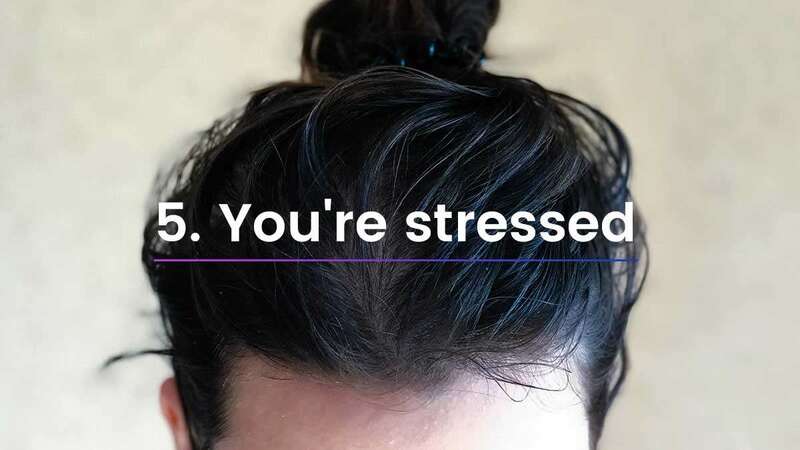 Solution: Let your hair rest. During the weekends, put the hair pomade down and just let your natural locks ~*shine*~! Yes, certain foods can trigger your scalp to go into overdrive. Teen Vogue explained that common foods that cause dandruff are "cheese, full-fat milk, spicy, and sugary foods." Solution: Cut certain foods out one at a time. To see if a type of food is behind your flakes, don't eat it for at least a week and see if any changes happen. Stress can make any skin condition worse and can make you more prone to scratch that itchy head of yours! Take deep breaths a few times a day to calm yourself down, or do yoga every week to clear your mind! Solution: Brush your hair after taking a shower. Not only will this help get rid of leftover oil and bacteria from your tresses, it will detangle any knots you have. If you have common skin diseases like eczema or psoriasis, there's a possible chance you'll also get dandruff, as these can spread to your head. Trust us, you should visit a doctor immediately to get tips on how to prevent future flare-ups and irritation. Did you figure out the main cause of your itchy scalp? If you did, here are more DIY solutions to get rid of them!